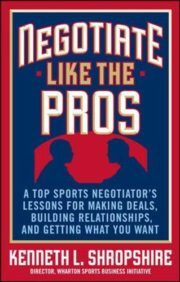 If you’re looking to build your deal-making chops, there is no better school than the world of professional sports. Few authors are as qualified to guide you through that rough-and-tumble terrain as Ken Shropshire. From the Fortune 500 to the NFL, from Don King to big city mayors, Ken has negotiated major sports deals across the country and around the world. He’s also one of today’s most sought-after negotiating coaches, with clients ranging from the National Collegiate Athletic Association to IBM. You also get a wealth of insider tips, tricks, and skill-building tools to help you develop a highly-effective, systematic approach to deal making. 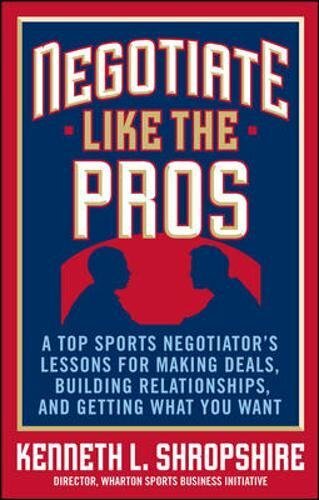 Whether you’re a fanatic who sees the world through sports-colored glasses, or a casual observer who wants to learn from some of the toughest, shrewdest dealmakers in any industry, this book will teach you how to Negotiate Like the Pros.